Some of you on Twitter may have seen my over-excited tweet last week while I was still reading Hammer of God. 🙂 Yep, I love the book! I read Empress in April 2009 and The Riven Kingdom in September 2009, so yes, it’s taken me some time to get through the series, but one of the strengths, right out of the gate, of this series and of Karen’s writing is that it’s memorable. In Empress, Karen took us to Mijak, a desert land where their god is worshipped with blood-sacrifices. It’s a land of warriors and priests and slaves, harsh and brutal and beautiful at the same time, and in Mijak Karen introduced us to one the best female lead characters I’ve ever had the pleasure of reading – Hekat. We also met Vortka and Raklion and Nagarak and Zandakar and Dmitrak, but it was Hekat who stole the show. In The Riven Kingdom, Karen took us to Ethrea and introduced us to Rhian, the only daughter of the ailing King. Rhian soon finds herself scrambling to survive and trying to get support for her own bid to ascend to Ethrea’s throne as its first-ever queen. The Riven Kingdom was a much-needed breath after the emotional and brutal rollercoaster that was Empress and took us to a world more easily understood, but it was as good as Empress was, for different reasons. Now, in Hammer of God, Karen brings Mijak and Ethrea crashing together, and what a clash it is! I’ve said before that Karen does characters brilliantly, and if anything, I felt she surpassed herself in Hammer of God. Here we’ve got a young girl, Rhian, having to take a position of leadership under the mos extreme circumstances; here we’ve got a man in a world alien to him who must learn a completely new way of life if he is to survive; here we’ve got a priest who sees the good in everyone but who is forced to oversee and do terrible things in the name of the god he believes in; here we’ve got a toymaker who misses his wife and only wants to make toys but is forced into the spotlight and chosen to wield a power he never believed in; here we have an Empress who believes, to the core of her being, that she is doing what her god wants her to do… Even the psychology behind these characters would be, on their own, interesting, and Karen brings them all beautifully and tragically to life – many times I shook my head, incredulous or stunned and I laughed plenty, too – sometimes because the characters had to laugh or die and I felt I needed it, too. That’s the kind of reaction that Karen managed to elicit from me. There was one culture and character that I didn’t get nearly enough of it was the people of of another great empire, far from Ethrea and Mijak, and the empire’s Emperor – I seriously hope we’ll be meeting these guys again some time! And I have to add, too, that the end of the book made me extremely curious about what would happen in both Ethrea and Mijak; these are two lands and cultures, with all their characters, that I’ll miss! All in all, Hammer of God is an excellent climax to a really interesting and intriguing series – cool magic, deep religious and political thoughts and discussions, and larger-than-life characters that really make you look at yourself and what you think and believe. 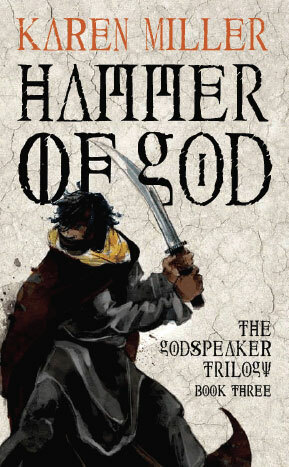 I’m giving Hammer of God an air-punching 9 / 10, and the Godspeaker series an excellent 8 / 10 – the trilogy is complete so you can read all the books in one go, no waiting for more volumes! Check out Karen’s website here and click this link to read excerpts of all the novels; to order your copies of Hammer of God, use the following links: Amazon US, Amazon UK and Exclusive Books (South Africa). Also, you guys in the UK are in for a treat! 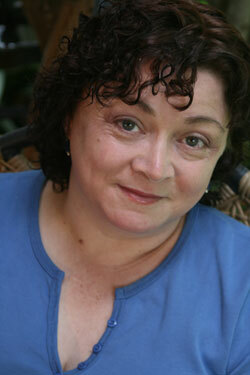 Karen will be at Forbidden Planet this coming Saturday (October 30th), along with NK Jemisin! Check out this link for more info. 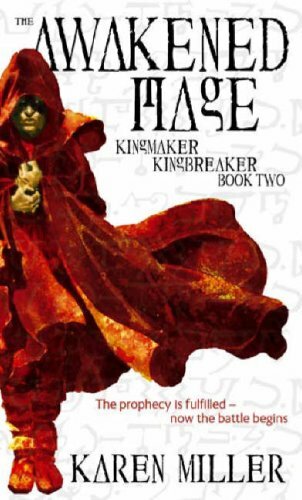 The second book in the Godspeaker trilogy really took me by surprise, I’ll admit that freely. In the first book, we met Hekat, a feisty and completely single-minded young slave girl who knows she is meant for more than the life she was born into; the book takes us through Hekat’s rise to power, introducing many memorable characters and showcasing a unique, interesting world, beautiful in even its harshness and brutality. One of the things that Karen did extremely well in Empress was immerse us in Hekat’s world, even going so far as to change her writing style to match how the people of Mijak spoke and expressed themselves. Karen also bravely brings in the question of religion, showing not only how destructive it can be but also how it can bring people together. She also does this in a way that wont tread on anyone’s toes, and might just enlighten the few that need a good wake-up call. Good on ya, Karen! There’s plenty more to enjoy though; Karen’s descriptions of Ethrea paint the scenery vividly, and she does so with an economy of words that many authors can learn from. What’s also interesting is the detail of Ethrea as a world – as you read deeper you realize that you’re not reading about a familiar world, but a world that is slightly skewed, subtly changed, making it an exciting place to set the tale. To get more info on Karen and her work, check out her site here, and order your copies – for those in the US, those in the UK and those in SA. The Riven Kingdom is published in SA by Penguin Books SA. As I confessed to Karen herself a while ago, I have something to confess to you all, too: Empress was the first book by Karen I’ve ever read. Sure I’ve read the prologues to Empress, The Riven Kingdom and to both of Mage-books, but Empress was the first. And why did I start with Empress and not The Innocent Mage? Well, I didn’t have The Innocent Mage at the time, only The Riven Kingdom, and Empress ended up being the first book I ran into. 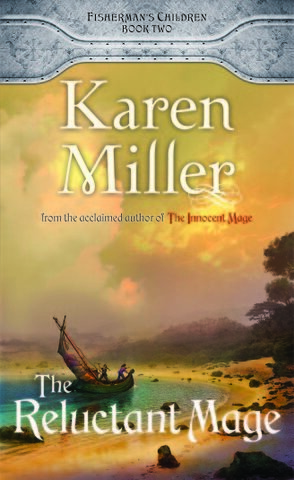 And I’m glad, because after I finish the Godspeaker series (of which Empress is the first book), I can get into her Mage-books and experience Karen’s raw talent. And trust me on this, Karen is a born storyteller! Empress begins with Hekat, and ends with Hekat. Who is Hekat? She is a slave girl, a she-brat who is useless to her father because he needs sons to work, and when Traders come through their village, he sells Hekat to them, pushing her along the first steps of a journey that will make her the most powerful person in the land of Mijak. The greatest aspect of this book is the voice Karen uses to tell the tale. Mijak is a land of slaves, warlords and godspeakers (holy men who are called to divine the wants of a brutal deity) and there is very little space for anything else than what the god has made known as your purpose. Only the high godspeakers of Mijak’s various territories are learned men, and perhaps Traders; if it is not in your purpose to learn how to read or write, you are not taught. Slaves are only taught to increase their value when it comes time to sell them, and warriors are taught to kill, warlords to direct that killing. As Hekat makes her way through Mijak, she learns that Mijak is divided into territories controlled by various warlords and that these warlords do not get along; but Hekat is lucky and is taken to the greenest, biggest Mijaki city, Et-Raklion. As Karen spins this tale for us, the characters live, and not only because they are so unique in temperament, personality, quirks and outlook. They also live because they don’t speak like lords and ladies or street urchins or smart-mouth youths. They are, by and large, primitive, and do is their way of life; this all is brought home by the voice Karen uses – there are no ‘big’ words, to hints of technology, to eloquently spoken philosophical concepts or sciences that can be learned. These people live to serve the god. The action is great and suitable – the violence is brutal, and characters are put into positions where they make choices about themselves that no sane person would… at least, no sane person who did not know of the god. And yet, even through this violent lifestyle, there are those, too, who remain good, although the ‘bad’ guys are some of the coolest you might ever get to know. I say ‘bad’ because there aren’t really any bad guys. There are zealots, yes, who will do anything to serve the god as they were taught, and there are those who are so desperate to hold onto what they have, even though it is meager, because it is all they have. Some take power freely, others are born to it. But every character serves a purpose, driving the story forward in their own unique way, bringing a richness to the tale that only the best in the business of writing can match. Even Mijak is rich in personality and detail, though the detail doesn’t overwhelm. We are shown a way of life that might have happened for us, or could still happen. The worldbuilding in Empress is deep and layered, serving to spice the story instead of cover it in icing, and when we are eventually told a portion of the Mijaki’s history it’s almost as if we knew, anyway, because of the way Karen layers the information. And at its core, Empress is also a cautionary tale, a warning that all of us should take to heart. It is about getting exactly what you want, and then losing your humanity because of it. It’s about believing in a higher power so blindly that your life has no meaning without it and you lose the knowledge of who you are. It’s about trying so desperately to live up to ideals that others have pressed upon you that you forget you have desires for yourself and your future. It’s about using power to fulfill yourself, about using religion to subdue and enslave instead of allowing it to bring enlightenment. And much, much more. All in all, Empress was an invigorating, enlightening read. I looked at the world with eyes that saw and understood a bit more, and I travelled to a far away land that terrified and beguiled me. And I understood that Karen Miller is going to be a long-time force in fantasy because she’s one of those writers that doesn’t lose sight of the humanity in any situation. A great, great read! A: Thanks so much for asking me! I’m told you’ve got a vibrant and enthusiastic SFF fan base in lovely South Africa, and I’m thrilled to be a small part of it. You’ve completed your Kingmaker, Kingbreaker (though, as I understand it, you’re not finished with it yet. :-)) series and the first novel in your Godspeaker series is selling all over the world: can you please give us introductions of both series’ for those readers who have not yet picked up your books? A: No, the KK series isn’t finished yet. I’m just about to start on the first of a two-part sequel, which will be followed up by a standalone prequel, and then the story will be told. The Godspeaker trilogy is a complete story … but there is one character in it whose life might be looked at in more detail sometime down the track. I ended up becoming very fond of and intrigued by him. 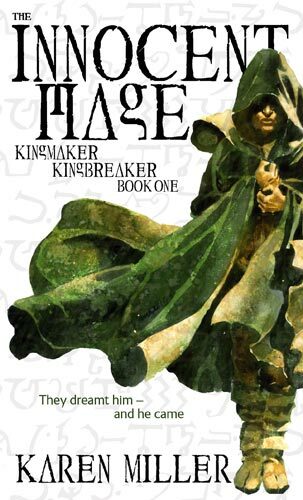 The Kingmaker, Kingbreaker duology (The Innocent Mage/Innocence Lost aka The Awakened Mage) is the story of two men from very different worlds, who become friends and join forces to defeat a terrible evil that’s been secretly hanging over their idyllic kingdom for hundreds of years. Asher, the youngest in a large family of fishermen, realises he’s got little future where he is, so he travels to the kingdom’s capital to find work and raise enough money to strike out on his own. In doing so, he crosses paths with the king’s son, who is in his own way as much of an outsider as Asher. Gar’s people have a monopoly on magic, and the king wields the most important magic of all, that keeps the kingdom isolated and safe. But Gar is crippled, and can’t do magic, so he has more in common with Asher than with his own people. Complicating matters is the fact that a clandestine group of people have been watching for Asher’s arrival for centuries, since they believe he’s the key to saving the kingdom from the evil that’s waiting to engulf them. All these lives tangle up with each other, leading to a great deal of drama. The Godspeaker trilogy is set in a completely different world. Bk 1, Empress aka Empress of Mijak, is the story of one powerless girl’s journey to adulthood and unparalleled power … and how that power changes her, and the world she inhabits. It’s also the story of her best friend, a fellow former slave, and how important he is to both her, and world events, and her sons, who struggle with having her as a mother. It’s the story of Hekat, who’ll not be ruled by anyone but her dark god. Bk 2, The Riven Kingdom, takes the reader to a new country, Ethrea, where another young woman, Rhian, is also faced with harsh choices regarding her future and her birthright … and where an important character from Bk 1 becomes an integral part of her life as she battles her church and secular enemies to secure the crown that is rightfully hers. 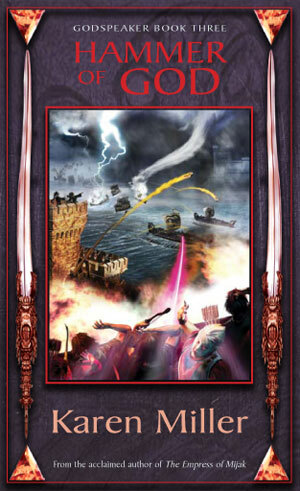 Bk 3, The Hammer of God, sees Rhian struggling to maintain control and deal with the looming threat presented by Hekat and her all-conquering army. Rhian and her people are all that stand between Hekat and the world’s destruction … but Ethrea has so many troubles of its own. Also, since I’m not sure if you’re aware of it, I’ll shamelessly mention that I’ve got a new series that’s already started releasing in Australia, and is coming out elsewhere in the English-speaking world in Jan 09, under the pen name K. E. Mills. That’s the Rogue Agent series. It’s fantasy too, but it’s a series of stand-alone adventures with continuing characters, and it’s set against a slightly more modern background than my other work. Think the flavour of late Victorian/early Edwardian England. I’m just polishing Bk 2 now. Bk 1, The Accidental Sorcerer, tells the story of a hapless young wizard named Gerald Dunwoody who can’t manage to keep a job. After his most recent career disaster he takes a position as royal court wizard to a foreign king … and very soon realises he’s jumped from the frying pan into an inferno. His best friends are an ensorcelled bird named Reg and a genius wizard named Monk, and when he teams up with the king’s overworked sister Melissande, in an attempt to avert a war, his life takes some very interesting turns. What were the themes that you wanted to explore with Kingmaker, Kingbreaker and Godspeaker? A: In the KK series, I’m exploring the themes of friendship, betrayal, loss and sacrifice. Of secrets, and the damage they can do even when they’re necessary. In the Godspeaker trilogy, I’m dealing with the impact of religion on a culture, and how belief can be a power for good, and for evil. I’m looking at how people without power can react to getting power, how power can be used and abused, how people with power can be warped or enriched by it. I’m also looking at the power of family, how at the end of the day — no matter how much worldly power we may or may not wield — so often it comes down to who we love, and how we are loved, and what we do with the love that’s inside us. And I’ll add, still shamelessly plugging J that in the Rogue Agent series I also examine friendship, and loyalty, and power, and how doing the right thing often isn’t the same as doing the easy thing … and how good people sometimes do bad things for the greater good, and how that changes them and the world they live in and the people they care about. A: I loved it. I had to stop, because on top of all the work I was directing a play earlier this year and something had to give. I hope to get back to it from scratch next year, because it was a lot of fun and useful for the work, as well. With such an explosion of authors coming out of Australia (both in SFF and out of it), what do you think contributed to putting Australian authors on the map? A: I honestly don’t know for sure. I mean, I think we’ve always had talent; it was just a question of getting noticed outside our own very small pond. And thanks to the great work from HarperCollins Voyager in Australia in putting our books in front of foreign publishers, the markets in other countries, especially the UK and the US, have seen that our stories translate well into their cultures. It also helps that the overseas publishers, like Orbit (my UK/US publisher) have been so willing to give outsiders a go. I mean, at the end of the day the only thing that matters is the story — where it comes from isn’t the point — but still, publishing is a competitive business and choosing foreign over homegrown authors can ruffle feathers. I know how much it means to me that my work was selected by an overseas publisher to reach a wider world audience — and I think other Aussie authors feel the same way. Very blessed. I mean, Australia’s a funny place. Like America, we were a British colony, so there’s that link between our three nations. And even though we’re still part of the commonwealth we’re very independent. We’re a pushy nation that runs around the world all over the place having a go at things. Every time you turn around you’ll find an Aussie, in just about every country you can think of. We’re there. And we’re pretty easy to get along with, on the whole. So there’s a freshness and a courage and a sense of humour in our outlook that I think comes through in the work. We’re young and we’re feisty and we have an energy in our national psyche that perhaps informs our writing, too. That’s all I can think of! Well, I honestly haven’t done that many … *g* but wherever I go, I just like talking to readers. That’s the buzz for me. There are so many, many wonderful books out there to read. I mean, if it’s a signing for me, well, I sign my books, but I love to talk about the books that I love, the authors that I love. The best thing about being a reader is that you can read many many many more books in a year than any one author can write. So you’re spoiled for choice. And sharing my love of reading with other readers is the best thing of all, and that’s what getting out to signings and conventions gives me a chance to do. With fantasy changing as a genre and the emphasis turning to grittier, un-formulaic storylines, what do you feel began this shift, and do you see it as a good or a bad thing? I don’t know that it’s changing, as such. I might say that it’s expanding. The tent is getting bigger, which means there’s much more room for different flavours of fantasy — and I say that’s a great thing. If you go back a few years, to the early explosion of fantasy fiction, when the most prominent names were David Eddings and Terry Brooks and Raymond Feist, leading on from the Tolkien style of fiction, basically you were looking at epic heroic storytelling and that seemed to define the genre. Not that I would describe those authors as being formulaic — I think they were the early explorers of the field, laying down the groundwork that then allowed other writers to come along after them and push the boundaries. And while some authors continue to work in the epic heroic field — George RR Martin and Brian Ruckley, for example, with Brandon Sanderson and Patrick Rothfuss as well — you’ve also got writers like Robin Hobb, who writes uniquely personal fantasy set against wide cultural backdrops, and Kate Elliott, who certainly writes epic fantasy but without the same emphasis on bloody battles, and KJ Parker, who again keeps things character-driven, as does Glenda Larke. And then you look at the explosion of urban fantasy, which is largely driven by female authors and a female readership, in which the central characters are women. I think that’s been an important development, because for so long women haven’t had a strong voice in speculative fiction. Even now, far more men are writing the epic heroic stuff, perhaps because there’s a mistaken assumption that women either don’t like or can’t write the tough battle stuff, the violence. Which makes me laugh, really, because some of those urban fantasies don’t pull any punches at all. Standing back from that, I think there’s certainly been a shift with regards to grittiness, and I think that reflects the times we live in, which are for many of us darker and more dangerous than our remembered childhoods. As an example, I’d point to the difference between the original Battlestar Galactica series, and Ronald D Moore’s (in my opinion, brilliantly) re-imagined version that’s currently screening. The original BSG seems fluffy and insubstantial, compared to the updated series. But that reflects a change in cultural mood, I think. And possibly the same thing has happened in the literary world. Readers are demanding, and enjoying, more politically and culturally complex works. Not everything that’s being published is that complex, of course, some stuff out there is just a damned good romp. But that’s wonderful, and that’s what I’m happy about. Like I say, the tent has grown bigger and there’s room for everyone. The only danger I see is that publishers, needing to make money, might make the mistake of focusing only on one flavour of fantasy … and when tastes shift again, as they will, they always do, publishing is cyclical, if they’ve not been clever they’ll not have enough books of a different flavour to keep the machine moving. At the end of the day, if you tell a great story honestly, with passion, I believe it’ll find a home. Provided we remember to honour and respect all the flavours of the fantasy genre, and their readers, I think our chosen field of fiction will continue to prosper and grow. Finally, how it felt to have been called up and asked to contribute to A Galaxy Far, Far Away? A: To say that I am humbled, awed and terrified to be writing in the Star Wars universe is about the biggest understatement of the year. I saw the original Star Wars at the movies, in 1977. I was still in high school, and a firm geeky sci-fi fan. All these years later I still remember the feeling of seeing the rebel ship, then the Star Destroyer, flying over our heads. I think I knew, on some deep level, that I’d just seen something very important. And, in all seriousness, the film changed my life. The people I met, the things I did, the dreams I pursued, because of Star Wars, have shaped me and influenced me and truly blessed me. And now I’ve been given this incredible chance to play in that world, to play with those characters … I’m beside myself. Terrified, as I say, because as a fan myself I know just how passionate and dedicated and protective fans are about Star Wars. But so happy. Especially since I’m playing in the prequel era, and I really love that era. I love the nobility and the tragedy and angst and the foreshadowed doom of the last days … which probably says I’m a whacko broad, but there you are. J I know there are people who love to groan and complain about the prequel films, but I honestly enjoy them. There’s so much wonderful character work in there. To me, they’ve been a great gift. I can only hope that the stories I’m telling do justice to the world that George Lucas created, and gave us. A: You’re more than welcome. Thanks to you, and to the readers, without whom I wouldn’t get to be having so much fun.